Are you looking to add dinosaurs to your child’s stash of toys? Have you been wondering where to find the best dinosaur toys for kids? Dinosaurs are a hallmark of childhood for most of us. Whether you couldn’t get enough of the Tyrannosaurus rex, Stegosaurus, or Triceratops, you probably had a favorite dinosaur yourself. If you’re looking to add dinosaurs into the mix for your kids, we have some great options here for you. We’ll take a look at some things you’ll want to consider when shopping — and then I’ll share some of the coolest dinosaur toys out there. Use the links above to check the latest prices or read our in-depth dinosaur toy reviews below. When it comes to choosing the best dinosaur toys you have lots of choices. It doesn’t have to be overwhelming though. 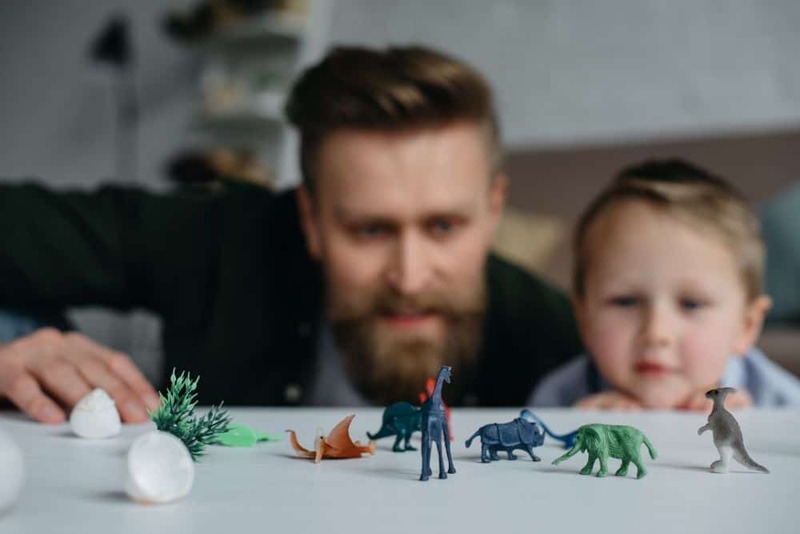 Here we’ll take a look at some of the important factors you’ll want to consider before snatching up those dinosaur figures. Educational: A captivating and perennial favorite, children love to learn about and explore dinosaurs. Don’t miss this opportunity for early developmental growth, and consider dinosaur sets that are more than just fun. Fun: On the flip side, fun is also important of course! If your toy isn’t engaging, it’s less likely your child will invest the time in playing — and learning (source). Realistic: If you have young children, you may want to stay away from realistic dinosaur figures. Toddlers and babies are usually drawn to cute figures or stuffed animals — they may be afraid of something too lifelike. For older children, on the other hand, realistic dinosaur figures can add to the drama and encourage creative play. Open-ended play: Dinosaur figures and playsets are perfect for open-ended play. This type of play has no finite conclusion or rules and encourages creativity and imagination (source). Providing your child with open-ended toy options can lead to great leaps in skill development, including language and social progress. Materials and safety: Whatever kind of dinosaur toy you choose, you need to make sure it’s safe for children to use. All materials should be safety-tested and any paints or finishes should be approved for use in children’s toys (source). Step back to prehistoric times with this traditional and popular choice in toys. Whether you have a younger child or your kid is nearer double digits, dinosaurs are loved by many ages. Let’s look at our top picks. This fun dinosaur game can be used in a variety of ways. Use it to encourage early math skills or to practice motor skills. It’s a great educational activity for teaching patience and allowing children to build social skills. This set comes with stacking cups, a dinosaur-shaped grabber, 48 dinosaur figures, two-game dice, a travel dinosaur backpack, and an ebook. Your child will want to spend hours creating their own games while building their skill base. This counting game is suitable for children ages 24 months and older. This set of four 10-inch plushies is a great way to introduce creative play to even the youngest children. 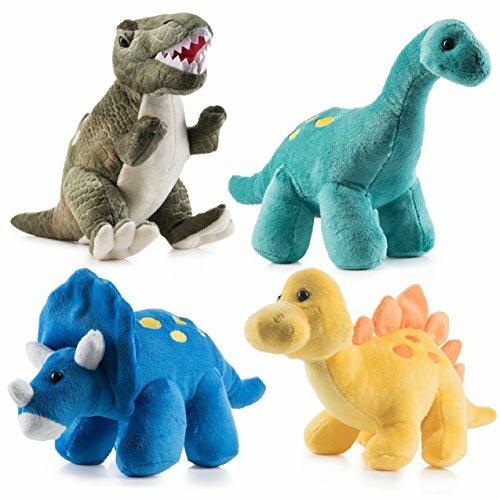 Great for toddlers, these cute and friendly-looking dinosaurs are brightly colored and an easy size to handle. This set is hand washable and the plushies are filled with stuffing material. The dinosaurs are soft, cuddly, and great for open-ended play. This BPA-free set comes equipped with its own travel-friendly case. It includes 20 different realistic dinosaur figures, 29 landscaping trees and rocks, and one playmat. It’s a great toy set for traveling and will provide hours of imaginative play. These dinosaurs are hand painted and suitable for children ages 3 and up. The playset comes with a money-back guarantee. If you’re dissatisfied with the purchase for any reason you’re able to return it. Great for ages 3 and up, this trivia card game is perfect for merging educational play and dinosaurs. 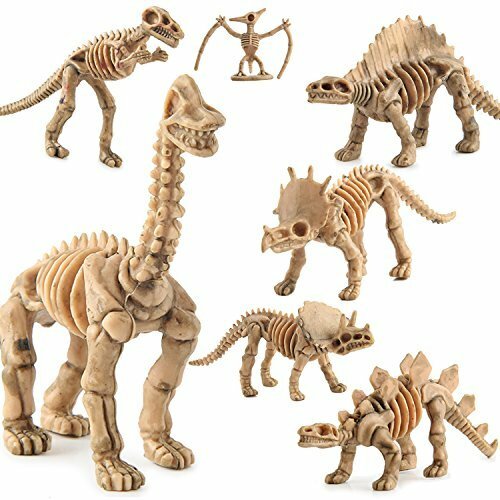 There are 13 dinosaur figures, made from high-quality materials that are Consumer Product Safety Improvement Act (CPSIA) approved. Each trivia card has three different questions so you can select the difficulty level that suits you and your child. Favorite dinosaurs that come with this game include T-rex, Brachiosaurus, and Pterodactyl. Looking for the coolest dinosaur toy? This might be one to consider. A set of 12 dinosaur eggs each contain a different dinosaur. Your child can experience paleontologist life while excavating fun, realistic figures. Accompanying full-color profile cards contain great information about the individual dinosaurs. 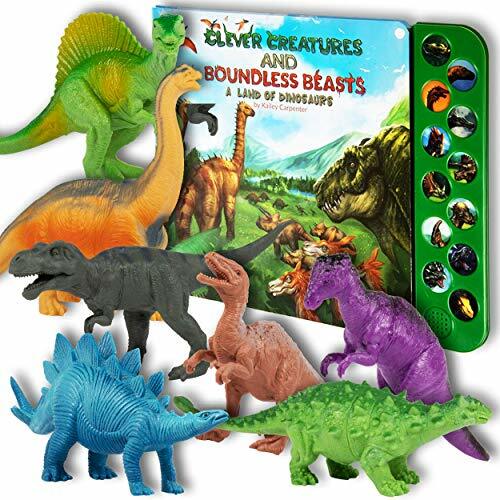 A STEM activity for children ages 6 and older, favorite dinosaurs in this set include Iguanodon, Ankylosaurus, and Tyrannosaurus rex. This 14–piece set comes with articulated dinosaurs, adding to the fun. Both the jaw and the legs are capable of movement. 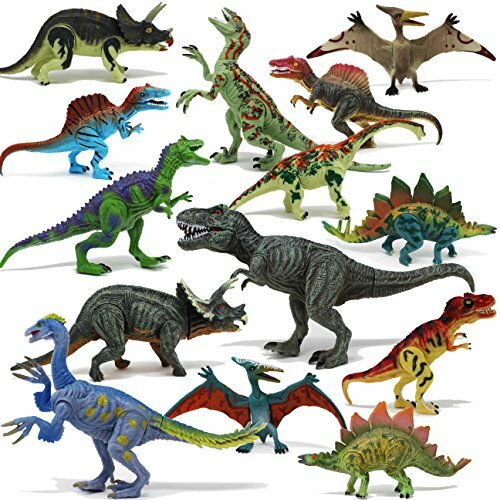 Ranging in size from 5–9 inches, these dinosaurs are suitable for children 3 years old and up. The hand-painted figures are made from non-toxic and BPA-free vinyl. They’re durable and conform to US toy safety standards. 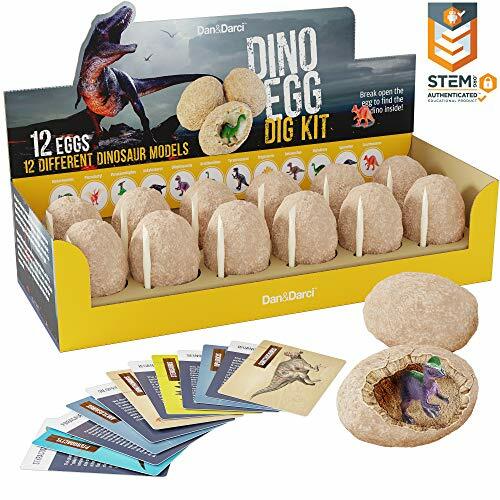 This educational dinosaur kit gives your child the opportunity to be a paleontologist. Not only do they get to unearth dinosaur fossils with this kit, but they also get to enjoy the accompanying full-color learning guide. 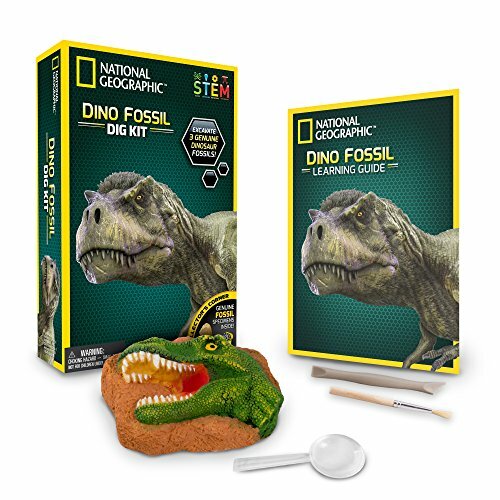 Suitable for children ages 6 and up, the National Geographic dig kit includes one digging brick that contains three different fossils. A no-risk purchase, this kit also comes with a 100 percent satisfaction guarantee. A great toddler dinosaur activity for children 24 months and over, this matching game encourages processing and motor skills. Durable and brightly colored, these cards are made from a thick cardboard material. 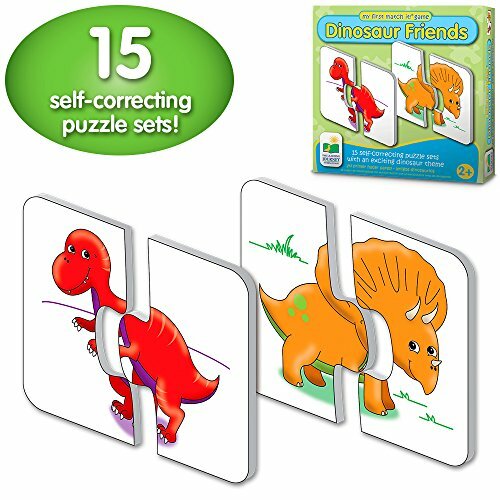 This matching game contains 15 sets of cards, each featuring a different dinosaur. No two puzzle pieces are cut the same, which helps your child know immediately if they’ve made a mistake. 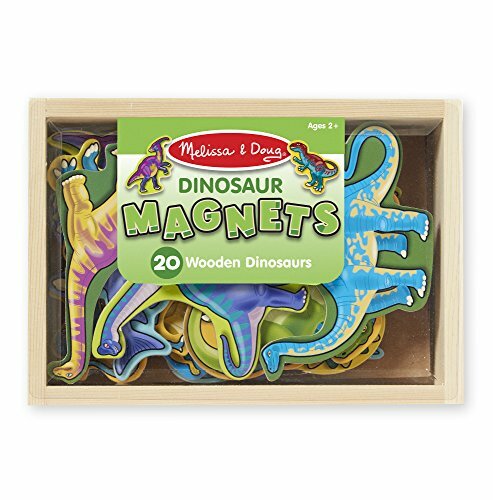 These 20 different dinosaur magnets come in their own sturdy wooden storage box. Varying in size from 3 to 6 inches long, the magnets are suitable for children ages 2 and up. The entire back of the dinosaur figure is magnetic. They work well on magnet boards as well as on refrigerators and other magnetic surfaces. 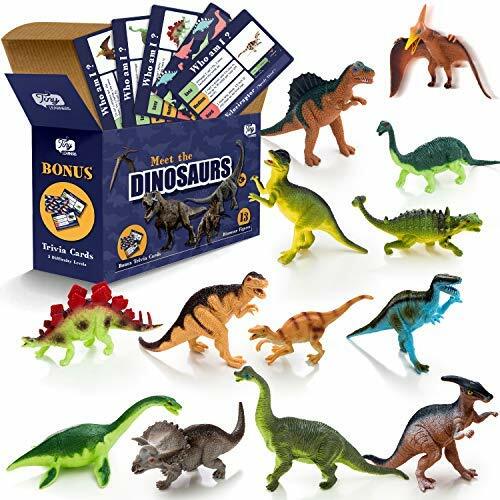 The dinosaurs are identified on the back of the storage box so children can easily learn the names of their favorites. 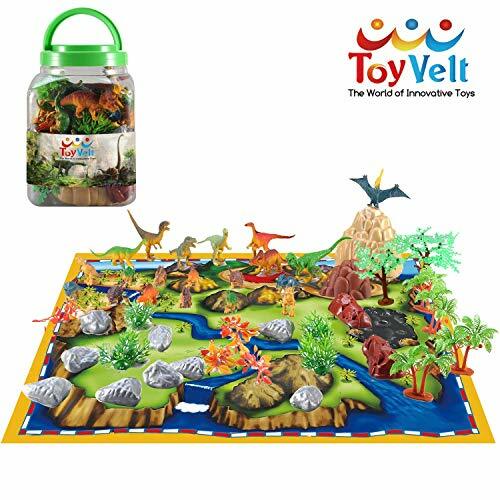 A great choice for children from the age of 3 years old, this fun set comes with 12 different dinosaur figures. Sold separately, there’s also a book that incorporates sounds as your child learns about the Jurassic and Cretaceous periods. The included dinosaur figures are each 7 inches. Brontosaurus, Allosaurus, and Triceratops are a few of the favorites featured. 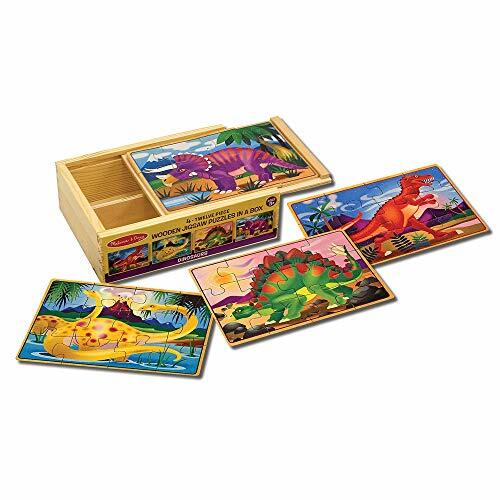 This puzzle set comes with four different beautifully colored wooden puzzles. A sturdy wooden storage box will help you keep track of your puzzle pieces and makes storage easy. This set is great for children between 3 and 6 years old, and helps encourage logic and processing skills. Each completed puzzle measures 7 inches by 4.5 inches. This 35-piece set contains 30 dinosaurs, 2 eggs, and 3 trees. It’s conveniently packed in a plastic storage tube. Each piece is approximately 2.8 inches tall and the set is suitable for children 3 years of age and older. 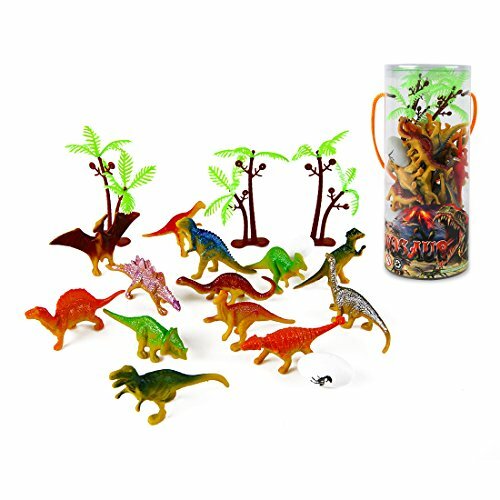 Made from non-toxic plastic materials, these dinosaurs can stand on their own. Their small size and travel tube make them a great choice for cars and prolonged periods in waiting rooms. 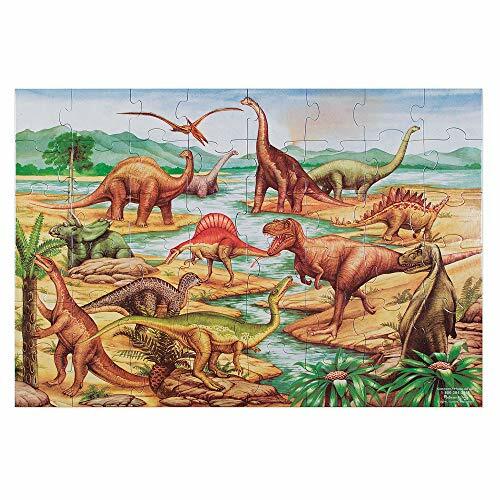 This extra large floor puzzle has 48 pieces and measures 2 feet by 3 feet when assembled. With original artwork and an easy-to-clean surface to keep your toy looking new, this puzzle promises hours of fun. Suitable for children ages 4 years old and up, the puzzle helps cultivate problem-solving skills and hand-eye coordination. This set comes with 12 small dinosaur fossil figures. A great educational piece that helps your child better understand dinosaur anatomy, this toy encourages learning and exploration. Each toy is capable of standing on its own. These are small figures, with the Tyrannosaurus rex standing about 2.5 inches tall. For children ages 7 and older. 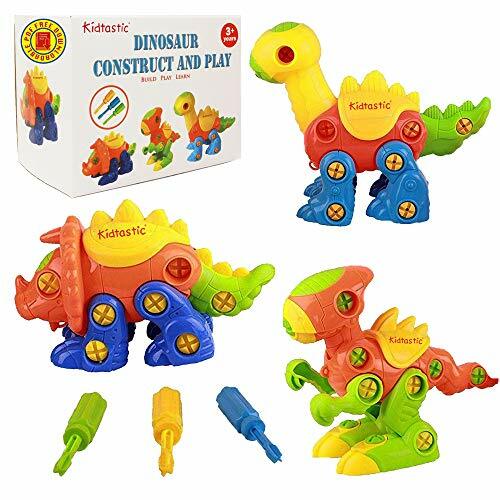 This 3D dinosaur construction set helps your child build social skills and learn how to troubleshoot difficulties. It encourages patience, spatial and analytic skills, and motor skills, all while having fun. 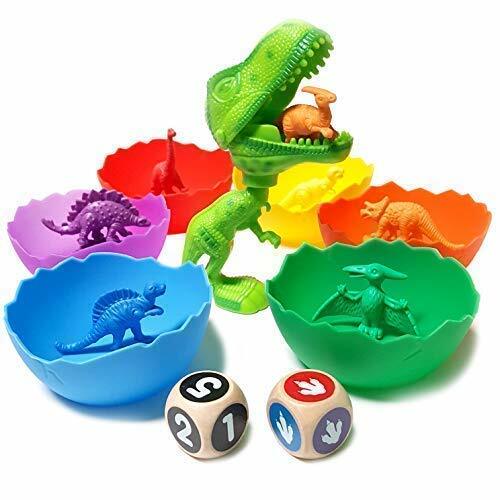 Ideal for children aged 3–6 years old, these three large and brightly colored dinosaurs are BPA-free, lead-free, and phthalate-free. This set comes with a 1-year warranty and a money-back guarantee. 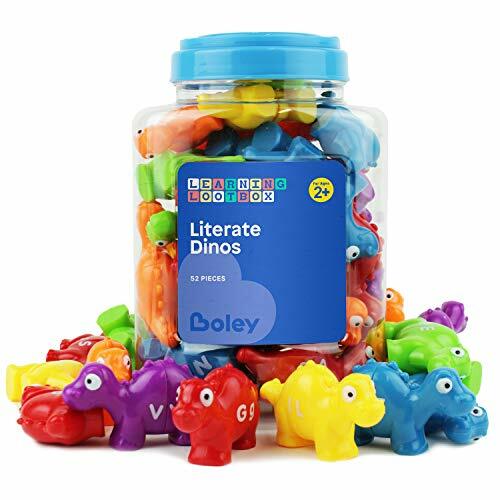 This 52-piece set includes 26 different dinosaurs sporting lowercase and uppercase alphabet letters. Each dinosaur pulls easily apart. Your child can sort and match, learning their uppercase and lowercase letters and how they relate to one another. Suitable for children 3 years of age and older, this set is entirely non-toxic, lead-free and phthalate-free. It boasts numerous safety certifications, including ATSM and BTSI. It also comes with a satisfaction guarantee. Not for the faint-hearted, this large dinosaur figure shakes his head and roars while walking, his eyes flashing. Tyrannosaurus rex has never seemed more real or fun than when playing with this engaging toy. Suitable for ages 3 years and up, this product comes with a satisfaction guarantee. 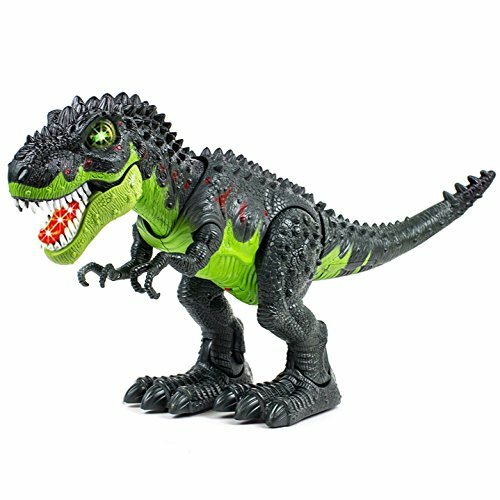 Made with high-quality and durable non-toxic and recyclable ABS plastic, this T-rex is also equipped with an on/off switch to help preserve its battery life. Whether you’re a 5-year-old child or a 55-year-old adult, dinosaurs hold appeal. It’s easy to see why the coolest dinosaur toys are always in high demand. Hopefully, you’ve seen an option or two here that will work well for you. I love them all, but if I could choose only one dinosaur toy for my shelf, it would be this Jumbo sorting and counting game. I love the variety of ways it can be used and the wide appeal across age groups. Did you have a favorite dinosaur toy when you were growing up? Have one at home your kids can’t get enough of? We’d love to hear about it — leave us a comment below!